Well. Had my hair done by the wonderful James at Toni & Guy in Solihull. Went to Boots and got hubby some sunglasses as he’s having his 2nd cataract done soon and really needs them. Luckily he actually liked them . . . also bought myself some No 7 “primer” – Airbrush Away or something and it’s supposed to make my skin look better (!) Will try it tomorrow morning. Currently watching the footie (England v Holland, friendly – hah!) and it’s half time, so thought I’d do a quick blog. 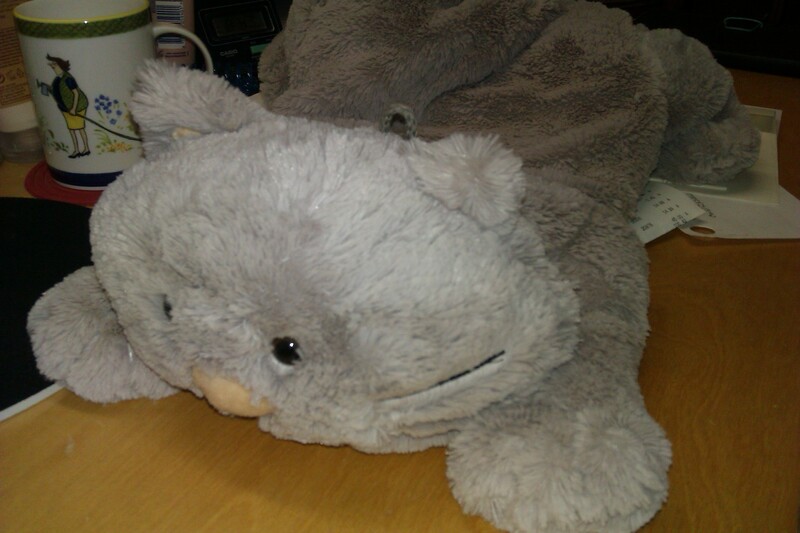 Hand/arm really giving me gip tonight, so here’s a photo of my warm bag, which my lovely French friend Rejane gave me. One minute in the microwave and you’re set. He’s lovely, isn’t he? the real cat isn’t too impressed with him, though. Actually went in the garden and swept up quite a lot of dead leaves today. Found a dead mouse in one pile – I had suspected, as we’d watched the cat sitting for some considerable time waiting for something to appear. It either died of fright or boredom or even starvation. Poor thing. But the cat is at least earning her keep. The real cat, I mean. Might consider a little light weeding another day . . .
Time for evening goat yoghurt plus large spoonful of jam. The heating, the loo, and m4p files. Well. Now then. The boiler has been switching itself off for a few days, and eventually on Wednesday night it just stopped altogether. Phoned up, got an engineer organised for Thursday morning. Snuggled up tight in the duvet to sleep and it was all ok.
Next morning, engineer arrives, fixes “dead as a dodo” boiler, but it needs power-flushing. This should have been done when it was installed three years ago, and in fact was paid for (by the government), but wasn’t done. Unfortunately the company who actually installed the boiler have gone out of business. Unsurprisingly. So we have to pay £500 to have it power-flushed. Bummer. The loo has been gradually blocking for a few days. I flushed it four times in a row this morning, but still getting worse. Hubby poured a big bucket of water down and now it’s fine. Hooray! m4p files. Hm. When you buy music to download from iTunes Apple Store, it is now protected, so that you can’t just copy it. Fair enough, but when you want to copy the music to another player in your own home, and you’re not ripping anybody off, it’s a pain in the neck. If you bought a CD, you could play it anywhere in your home. But not with m4p files. After much searching on the internet, and discovering that lots of people would like to charge you money to convert the files, I found out that if you go into iTunes, set up a playlist of all the music you want to transfer, then burn it to a CD, and then re-import that CD, it removes the protection. You can only do it a limited number of times, but that’s ok. It is longwinded, and the track details for only 4 of the 50 songs were automatically found, the rest I had to play a bit of the track and then type in the details manually, which added to the length of time. But it worked. It also duplicated all the tracks . . . but that’s sortable. Again, it’ll take time, but sortable. Today took hubby to the GP – he hasn’t been allowed to drive for a week because of a virus which caused him to be extremely light-headed – and hooray! he’s allowed to drive again. He’s mightily relieved, it’s a big pain having to rely on lifts everywhere, but it wasn’t a problem for me. He’s always taken me places when I can’t drive, bless him. Lovely sunny day today – quite warm too. Cat is playing happily outside so I’ve washed and changed her bedding. I bought some lambswool from the Rag Market and made it up into four covers, two for her radiator bed, one for her night-time bed, so I can have one in the wash and one on each bed. She absolutely loves them, and kneads them like billy-o. One of my friends from the knitting class we both used to go to came round a couple of weeks ago, and suggested I might have a go at machine knitting with the garter carriage. 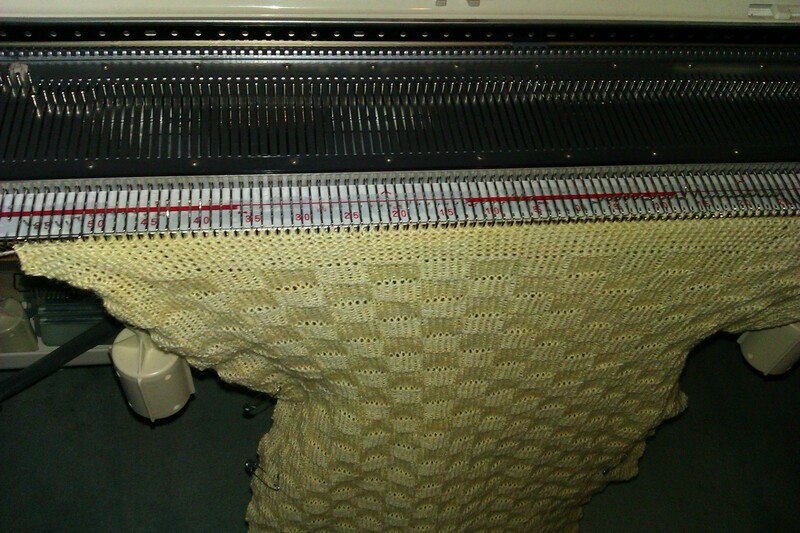 The garter carriage not only does garter stitch, and patterns, but is connected to the power and works automatically, and chugs up and down the bed all by itself. So once you’ve cast on and got it all set up, it just knits. What a good idea, I thought. So I had a go with a small sample, and did a sort of basket stitch with a garter stitch border, and it worked really well. Next step – try a full sized baby blanket for an impending (actually, almost imminent) baby. That caused me a few problems – five stitches dropped during the knitting process, but I thought I’d just cover the resulting mess up with baby-type appliquéd motifs. Finally, after 444 rows (including 22 rows at the top and bottom for the borders), I was in so much pain with my hand I haven’t been able to touch the damn thing at all. And can’t find any affordable motifs either. Currently I’m planning to take it off on waste yarn, which means I just change yarns and knit a few rows in stockinet, and just take it off without casting off. So I think it was worth trying, but really, it hasn’t worked too well. Yes, it’s Valentine’s Day. It’s been a couple of weeks since I posted, because I’ve been trying to add this blog to facebook, so that when I post a blog, it appears in facebook too. Finally think I may have managed it – this post will be the proof of the pudding. Today I got up late, and went to see my lovely nieces, Sarah and Katy. They have five children between them, all aged between 9 (nearly 10) and 3. It was absolutely lovely. We sat and drank tea, played with the children, chatted, and it was just great. Yesterday I fetched my new specs from Specsavers. They’re “Red or Dead” – is that cool? I don’t know, but I do like them. Also two new pairs of reading glasses for £25 each, so there’s a pair by the bed, which is very useful. Over the past couple of weeks we’ve been having a bit of a sort out in the study. There are fifteen shopping bags full of shredded paper – mostly bank statements from the past 20 years . . . so the filing cabinet is now down to two drawers’ full rather than three. So I’ve ordered a new two-drawer cabinet and we’ll sell the old one on ebay. The smaller one will look much better and impose on the room much less. Am very excited about it. That’s because I’m a big saddo and such things as organisation, and linear order, in my life, do make me excited. 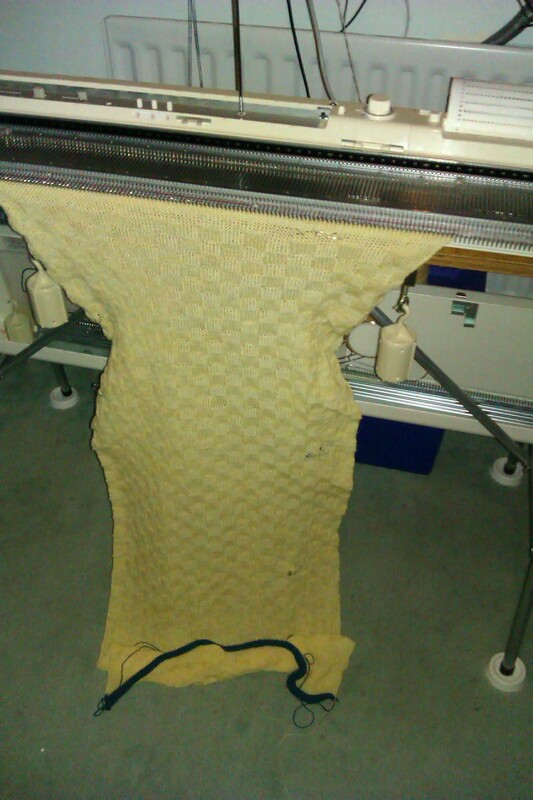 Tomorrow I’m going to have a go at machine knitting. My friend Sheila from the knitting class came round last week and pointed out that the garter carriage is an automatic carriage, so if I can cast on and just set it off it’ll do the knitting for me. Why didn’t I think of that? if I do a baby blanket, there’ll be no shaping involved either, so tomorrow’s The Big Day. Still waiting for surgery. I think I’m going to stop mentioning it now, and just blog about it when it’s happened (well, as soon as I can type again). Also we’ve bought a Sonos set up so that when we listen to music or radio in the kitchen or the study, it’s coming from the hi fi in the lounge. I’m really not sure how it works, but it’s excellent. You can either have each room (zone) doing something different, or have them all locked together. Wonderful for when we listen to the Archers!